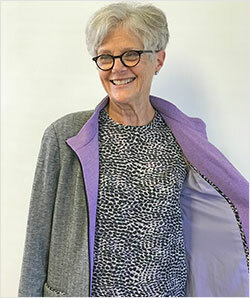 Notes: A prolific member of our lively Thursday sewing class at AAF, Liz chose a casual jacket pattern with a stylish zipper closure. Utilizing both sides of the fabric, she added lots of pizazz. 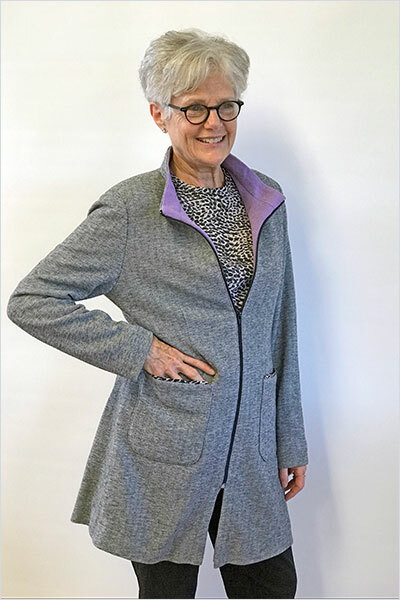 The facing is the complimentary reverse of the gray herringbone.The lining is a stretch polyester that works perfectly with a knit. 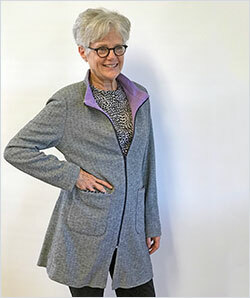 Additional details include a flat 3/8" contrasting piping on the pockets and between the front facing and lining of the coat. 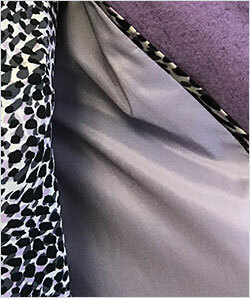 The contrasting print shell is the perfect fabric for this double-faced knit. These choices pull the whole look together and make the end result easy to put on and go.